You come into contact with products made from plastic materials every day. There&apos;s the case that protects your phone, your computer keyboard, children&apos;s toys, product packaging and dishware. Why are plastics so popular these days? For starters, they are low cost when compared to most other materials. 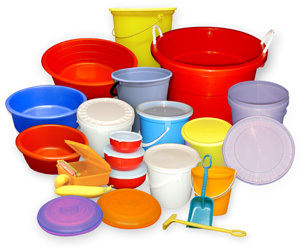 Plastics are also very versatile, easy-to-manufacture materials. Most consumers take plastics for granted – and that&apos;s somewhat unfortunate, as plastics are cool, unique materials – and new plastics are constantly being developed. 1) The roots of plastic materials actually date back to the 1600s, when synthetic materials were made from bio-derived items such as eggs and blood protein. The first man-made plastic came over 200 years later, when Alexander Parkes developed parkesine, a material made from cellulose and treated with nitric acid. The first fully synthetic plastic, bakelite, was developed in 1907 New York. Scientists have developed a wide array of plastics with many special properties in only 100 years. 2) A species of fungus has been discovered in the Amazon which feeds on plastic and can do so without oxygen. While this might not seem like a big deal, researchers are currently studying the fungus – and plastic – to see if advances can be made in bio-remediation technology. 3) Scientists are continually making improvements to plastics. One cool example of this is the self-healing plastic, "the Terminator." Check out the video below to see how it works. 4) As you know, plastic is one of the most widely used materials in product development. In fact, thanks to continuous research and development, it&apos;s estimated that we use about 20 times more plastic today and we did 50 years ago. 5) As plastic has become more popular, so have the various recycling methods. These efforts are important, as most plastics take a long time to decompose. In fact, it&apos;s estimated that energy saved from recycling one plastic bottle is enough to power a 100 watt light bulb for an hour. According to the Environmental Protection Agency, recycling one ton of plastic is good enough to conserve 3.8 barrels of crude oil. 6) Madison, Wisconsin has a "city bird." 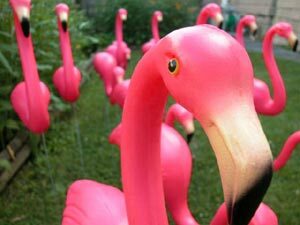 Officially, it&apos;s a plastic flamingo lawn ornament. A plastic bird still counts as a bird, right? 7) In 2012, the Obama Administration finalized a standard that will increase fuel economy to 54.5 miles per gallon for cars and light trucks by the year 2025. How are automakers modifying vehicles to get to this landmark fuel economy? Part of it is the use of plastic, which not only decreases a vehicle&apos;s curb weight to improve fuel economy but in some circumstances also reduces costs. Automakers are increasingly interested in fiber-reinforced plastics as a replacement for steel. Their interest is driving rapid development in this field. 8) Plastics play an increasingly important role in aviation and aerospace. Aerospace companies use plastic materials to make lighter planes. Some plastics, like PEEK, do well in the air because they are chemical resistant, lightweight, and relatively strong. 9) More than 600 billion pounds of plastic are produced every year, with polyethylene (the material used in plastic bottles) being the most popular type. Thousands of plastic material grades are available. 10) Plastic has played a central role in the development of the medical industry over the past 60 years. Plastic materials are used to create the disposable needles, bandaging, IV drips, and testing equipment that are so vital to modern medicine. Swiss researchers recently developed a polymer that can be ingested in pill form and deliver dosage to the appropriate parts of the body that need treating. Plastics have also had a huge impact on the development of high quality prosthetics. 3D printing is on the verge of making custom prosthetics cheaper than ever before. Questions? Comments? Let us know in the comments section below. 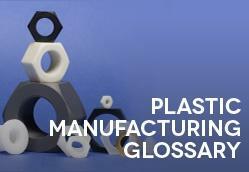 Interested in learning more about plastic manufacturing? Download our free e-book!